Rank: #4 out of 41. Its features read like an instructor's wish list: a locking footbar, a four position one-hand gear bar, alignment graphic for student and instructor, as well as an integrated side-split platform with the ability to add a jump board. It's adjustable and easy to use, making it perfect for any busy studio or education training center. FIVE-YEAR LIMITED WARRANTY ON THE FRAME STRUCTURAL COMPONENTS, RAILS AND TOWER EXTRUSIONS, EFFECTIVE AS OF THE INVOICE DATE OF THE ORIGINAL PURCHASE. Peak Pilates Fit Reformer is a very popular and one of the more expensive options. 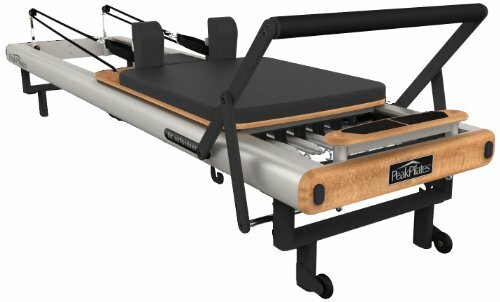 It's in the top 3 bestselling pilates reformers and has a couple of popular alternatives in the same price range, such as Balanced Pilates Allegro . Peak Pilates Fit Reformer is $1545 more expensive than an average pilates reformer ($750).